Combining VARIGEAR® variable speed gear units with reduction gear units of all designs in the SEW-EURODRIVE modular concept creates variable speed drives with a low output speed and high output torque. The combination of variable speed drives with helical, parallel shaft helical, helical-bevel and helical-worm gear units has proven effective at low speeds. The VU and VZ designs of the VARIGEAR wide V-belt variable speed gearmotors are used with power ranges of up to 45 kW (60 hp). Typical speed setting ranges are 1:4, 1:6 and 1:8. 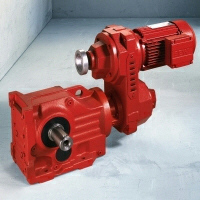 The U- or Z-shaped power flow and numerous combination possibilities with reduction gear units mean that these speed gearmotors can be supplied in a broad range of designs. They can easily be tailored to the most diverse machine structures. Purchase your SEW Eurodrive VARIGEAR VU/VZ Series Variable Speed Gear Motor today!